Ingrown hairs happen when a hair becomes trapped underneath the skin and grows back on itself, rather than pushing up through the skin. It can appear in the form of a spot or bumps on the surface of the skin. Sometimes you can see the hair growing underneath the skin too. Men often suffer from ingrowing hairs on the beard area caused by shaving, while women tend to get ingrown hairs on the legs, bikini and underarm. People with very curly or coarse hair can be particularly prone to this problem. 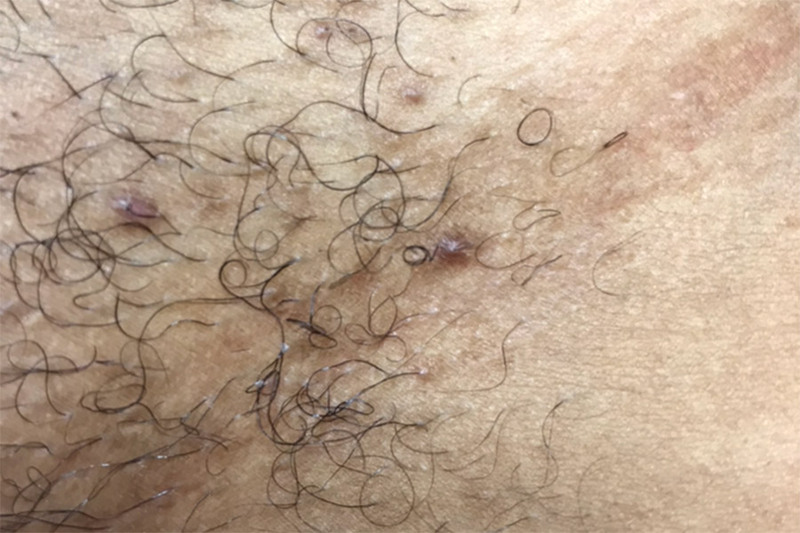 How is an ingrown hair caused? They are Usually caused by friction, dry skin, weaker hair follicles or shaving to close to the skin or repeatedly over the same area. What treatments are available for ingrowing hairs? We offer a range of skin treatments for removing and eradicating multiple ingrown hairs in any one area (e.g. full leg, bikini etc). Why not book a consultation with one of our skincare therapists? They will examine your skin, answer your questions and recommend the best treatment for you. Treatments for ingrowing hairs are available at both our Kensington and Wimbledon skin clinics. Please note: our treatments are suitable for multiple ingrown hairs in a single area rather than individual ingrown hairs.